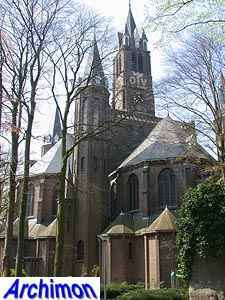 In 1841 a first church was built in the village of Het Heike, which was renamed into Sint Willebrord, a bit like the name of the new parish, only with an E instead of the second I. 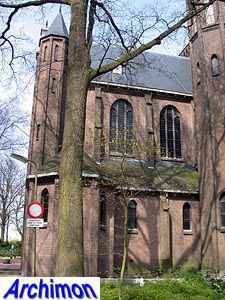 The first church was a building in neo-Classical style. In 1885 a copy of the famous grotto of Lourdes (France) was built near the church and the village became a place of pilgrimage. 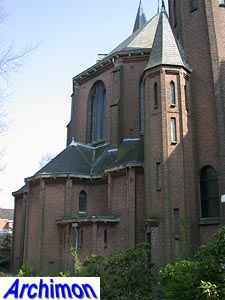 In 1925-1926 a new church was built at a short distance, as well as a new copy of the cave. The old church has been used for several uses since, but with a new facade. 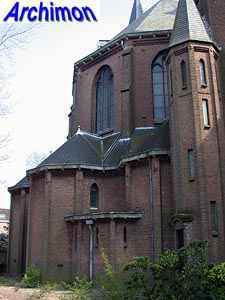 Officially, the design of the new church is attributed to architect N.J.H. 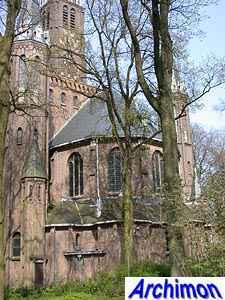 van Groenendael, but it was based on plans made by the local priest father Bastiaansen. The drawings of both designs, as published in February 1925, show that Bastiaansen provided much more than a general idea and a few sketches; his plans for the church are quite detailed, and it's hard to find the differences between the drawings and the finished church. 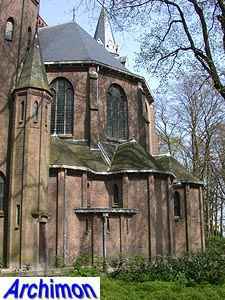 Van Groenendael's version of the design is more refined in its details, but eventually many of his proposals were not realized. 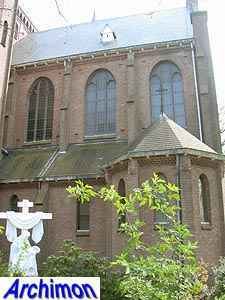 Bastiaansen took his general inspiration from the Rosary church and the church of the Immaculate Conception in Lourdes. 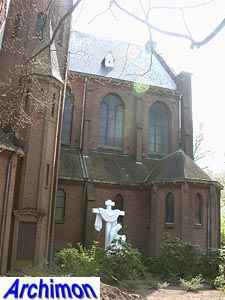 His church emulates the view from the west at the combination of these two churches; the two polygonal towers of the (underground) Rosary church and the tall tower of the Immaculate Conception church seen in between them. The ground plan was based on that of the Rosary Basilica, a cruciform centralizing space with fifteen radiating chapels. 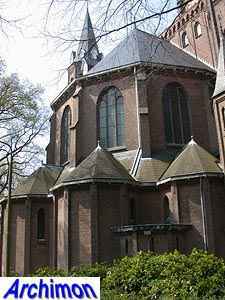 But while the Lourdes example is only illuminated by direct daylight from above, Bastiaansen realised his church needed highly positioned windows to illuminate the inside of the church without sacrificing the space for the radiating chapels. As Sint Willebrord was a poor village, in fact one of the poorest in the country until the 1950's, Bastiaansen chose to realize his ambition without expensive natural stone or profiled bricks. 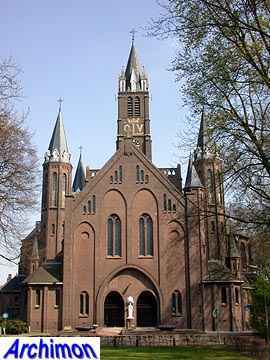 Although in a more or less neo-Gothic style, the church has no truly pointed arches whatsoever. 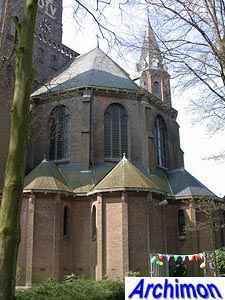 The church has a short basilican nave with narrow side-aisles with small windows. There's an abundance of polygonal stair-turrets; one at the south side at the front and four at every corner of the crossing, each of which has a smaller one attached to it. The taller towers around the crossing contain additional chapels and also serve as light towers. The tall tower on top of the crossing was inspired by the frontal tower of the Basilica of the Immaculate Conception. The combination of this tower and the four corner turrets was meant to emulate the Lourdes sanctuary from all four sides of the church. 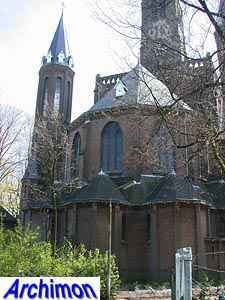 Interestingly, Van Groenendael did not contest this part of Bastiaansen's plan, even though it was highly unconventional and shows the priest was an amateur in the field of architecture after all; instead Van Groenendael provided a sound technical solution for this part of the construction, with the tower resting on four reinforced concrete arches. 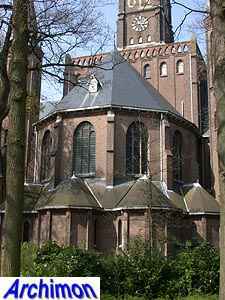 The choir and the transept-arms are identical on the outside, all being polygonal and with five radiating chapels each. Further chapels flank the front of the church, one dedicated to Mary, the other to St. Willibrord, the patron of the church and the village. 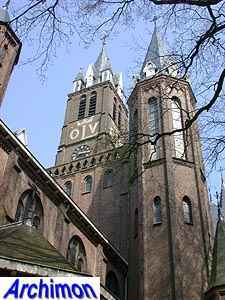 The letters OLV on each side of the tall tower stand for Onze Lieve Vrouwe, meaning Our (Dear) Lady, and are the cause of some confusion over the name of the church, which in literature is sometimes incorrectly called O.L.V. 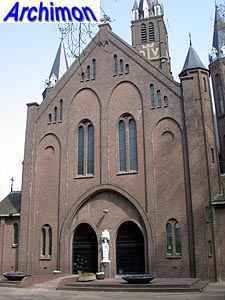 van Lourdes ('Our Lady of Lourdes'). Also incorrectly, in literature the church is often attributed to J.H.H. van Groenendael, one of the architect's brothers.